On Tuesday, October 13, the Rocky Point Rotary Club welcomed guest speaker Mark Baisch, President of Landmark Properties. Mr. Baisch gave a wonderful presentation on how he works closely with the Rocky Point VFW and Joe Cognitore to build new homes for returning veterans. Mr. Baisch shared that his hope is to continue to work with other organizations to build new homes for veterans returning home from Afghanistan and Iraq. Mr. Baisch explained that the homes built to date were made possible through donations of land, dollars, and the reduced charges of materials and labor. Thank you, Mr. Baisch, for visiting with the Rocky Point Rotary and for all you do for our returning veterans! 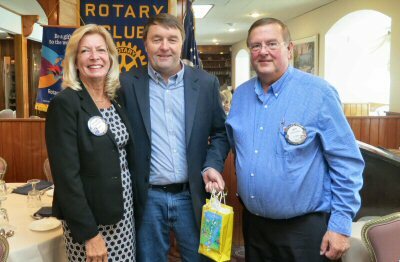 Pictured above (l to r): Rotarian Ann Marie Roberts, Mark Baisch, and Rotary President Jeff Hulse.